Kerala and South Tamil Nadu are set to become Hindu minority in the next 50 years. At the turn of the 20th century, Kerala had 69% Hindus in the state, which was divided into three separate regions. The Malabar in the north, was in the hands of the British, the small Cochin state in the centre, was under a prince and the Kingdom of Travancore bestrode the southern half like a colossus. Kerala’s population has always shown some very specific patterns. Malabar, in the north, was originally under the influence of the Arab traders and always had a slightly higher Muslim population. At the turn of the 20th century, except for the region of Malappuram, the Muslim population in the remaining Malabar was between 10% and 30% for the most part. Malappuram was remarkable for being the only district with a Muslim population majority, mainly due to Muslim predominance in the Ernad area. This area is also the region that initiated the Moplah revolt, during Gandhi’s support to the Khilafat movement, leading to the murder, persecution and flight of thousands of Hindus. Nor was the Moplah revolt the first Jihad – it was actually the 52nd major ‘civil disturbance,’ since 1830s, as recorded by the British. In the centre, the small state of Cochin, covering parts of Thrissur and Ernakulam, always had a high Christian population – from 1901 itself, at least. And in the south, the Kingdom of Travancore saw major changes in the rise of Christian population in the 19th and the first half of the 20th century. In short, by 1901, all three regions had Hindus between 45 and 75% in total. Between 1901 and 1951, the Muslims rose by 0.25% (from 17.28% of Kerala to 17.53%), the Christians rose by 7% (from 13.8% to 20.9%) and the Hindus fell from 69% to 61%. In Malappuram district, the Muslims were the absolute majority in Kerala. In Ernakulam, no religion formed the majority. But in the remaining districts, Hindus formed >60% of the total population in 1951. In this article, we shall focus on the changes that have occurred in the religious demography of Kerala between 1951 and 2011 and predict the future trends in population for the next 50 years. Owing to geographical proximity, we include Kanyakumari of Southern Tamil Nadu in this study, but consider its religious demography separate from the rest of Kerala. For the sake of convenience, we have amalgamated Cochin-Travancore into one region (called Travancore from now on) and have considered Malabar the other, in this article. From 1961 onwards, when the Christian population peaked, there has been a gradual (at first) and then a sharper rise of the Muslim population in Kerala, and a gradual retreat of both the Hindus and the Christians. The region most affected by the change in population is the Malabar, where the low fertility of Hindus, combined with higher fertility and an already existing higher Muslim population has seen many districts rapidly change their demographic character. The changes in the far south, in Kanyakumari district, have been equally pronounced, due to rapid conversions to Christianity. Kanyakumari, one of the holiest places of Hinduism, is already a Hindu minority and is set to be the Christian majority soon. In the first part of the article, we present our conclusions about the various districts (and regions) of Kerala. We predict, which districts (and regions) will become a Hindu minority by 2061. We also show that the overall population of many districts is set to change rapidly. A low Hindu fertility, conversions to Christianity (in some areas) and a higher Muslim fertility have changed the demographic character of the state. The region under consideration (=Kerala and Kanyakumari) comprises of about 35 million people, or roughly the entire population of Assam. And unlike Assam, where roughly 2 regions (of about 9 million people in total) were set to remain a clear Hindu majority, we show that none of the regions in Kerala will have any significant Hindu majority. 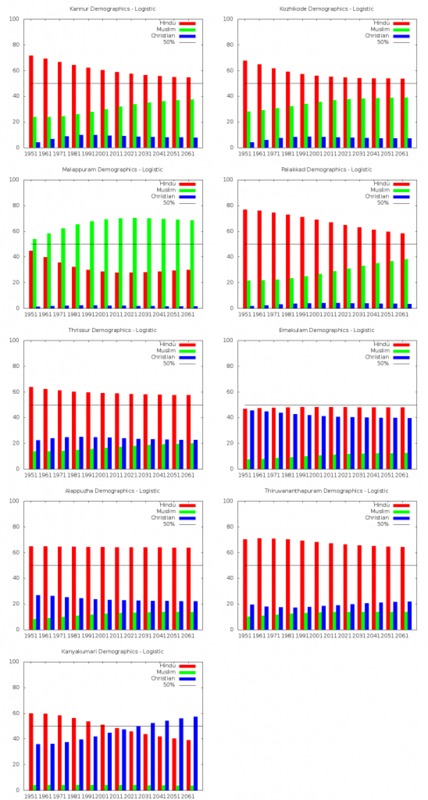 We employ three separate techniques (constant growth model, polynomial model and logistic model) to forecast the populations of the Hindus and present our conclusions based on all the three models. In the constant growth model, we assume that the growth rates currently found for the different communities will continue to hold over the next five decades and predict the population from those models. In the polynomial model, we try to fit quadratic polynomials, which show the least square error to the data and predict the populations and percentages of the various communities for the coming decades. 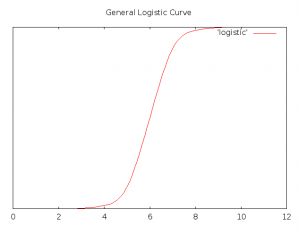 In the logistic model, we try to fit a logistic curve that assumes that all populations head towards stability and attempts to fit the curve to the data points, minimising the square error. Note that one may observe a discrepancy in the percentages predicted by the logistic models and the other two (constant growth and polynomial) models. The discrepancy arises because the logistic model assumes that the population of each group stabilises to a certain value (see figure below) and cannot account for negative population growth that has already begun in some areas of Kerala and will accentuate in the coming years. Consequently, the Hindu and Christian populations predicted by the logistic model are likely to be overestimates. Alappuzha, which consists of Alappuzha, Pathanamthitta and Kollam; Thiruvananthapuram; and Kanyakumari. These five districts, together consist of a population of 20 million people. In all our calculations, we have considered Hindus to comprise of Hindus, Jains, Buddhists and Animists. All the different categories other than Hindus are <1% in all the districts that we have included in our analysis. Consequently, we have included them in the Hindu category. Christians and Muslims have both been modelled separately. From the above table, it is clear that out of the nine districts in Kerala-South Tamil Nadu, five of them (Kannur, Kozhikode, Malappuram, Ernakulam, and Kanyakumari) will be Hindu minority and three more (Palakkad, Thrissur and Thiruvananthapuram) will be hovering between 50 and 60% in 2061, according to two of the three models (constant growth and polynomial). 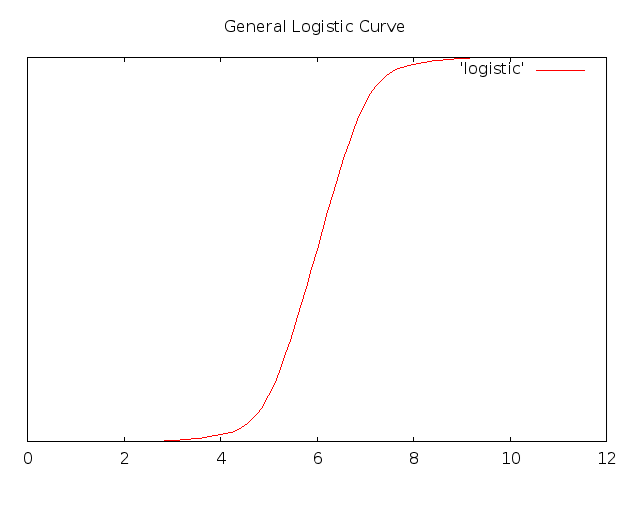 These models are more realistic than the logistic model as explained above. From a time (1951), when seven of the 9 districts were more than 60% Hindu, the Hindu population will have fallen into a state where eight of the nine districts will have a Hindu population less than 60% (in 2061). Of the two regions, Malabar was 65.34% Hindu in 1951. The Muslim population of the region was 31.42% and the Christian population was 3.24% in 1951. In 2011, the Hindu population was 50.53%, the Muslim population was 43.64%, and the Christian population was 5.83%. The Hindu population of Malabar is set to fall to somewhere between 40% and 45% in the constant growth and the polynomial models by 2061. Malabar will, in fact, become a Hindu minority starting 2021 itself. The actual curves that we present for each model below will show that across all the districts, the population share (1) of the Hindus will monotonically decrease in the next fifty years, and (2) of the Muslims will monotonically increase till 2061. The population shares of the Christians will decrease, except for Kanyakumari, where it will increase. Further, Malabar will gain population much faster, while the Cochin-Travancore are likely to lose population. This will contribute to a rising share of Muslim population and the fall in share of both Hindu and Christian populations in Kerala. Across all the districts and in every model, the population of the Hindus will start decreasing in absolute numbers by 2061, and the population of the Muslims will keep increasing till 2061. The population of the Christians will increase in absolute numbers in some places and decrease in other places. In the table below are given the dates from which the Hindus are expected to start decreasing in absolute numbers (not merely population share) in the various districts. Table 2: Shows the decade in which the Hindu population will begin to decrease in absolute numbers in the districts of Kerala and South Tamil Nadu, according to the polynomial model. 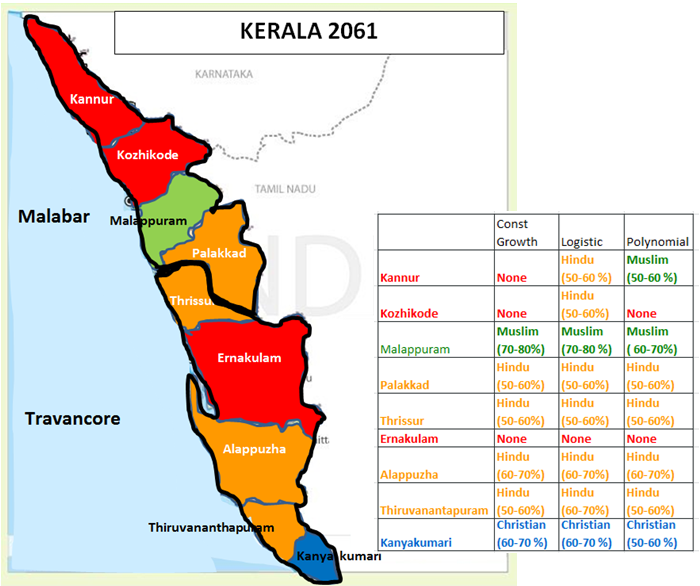 *Malappuram and Palakkad show their population nearly constant in the 2051-2061 decade. Both the overall Hindu and the Christian population are set to fall in the coming years, due to extremely low fertility (Christian population in Kanyakumari is growing due to conversions, rather than any higher fertility). The Muslim fertility is not high (indeed, it is lower than the Hindu fertility rate in states like Rajasthan and UP). But the relative difference is contributing to the fall of the Hindu population share in the coming years as reported in the previous take home message. The Christians may be able to reverse the demographic trend by converting the poor and other vulnerable classes. Since, the Hindus do not proselytize in any significant measure, the Hindu population is set to decline continually and relentlessly over the coming decades. Table 3 reveals that by 2051, the Hindu population of Kerala will have fallen below the 50% mark in both the constant growth and the polynomial models, which happen to be more accurate than the logistic model in this case. Table 3: The table presents the population of Hindus in 1951 and 2011 and predicts the population of Hindus in 2061 by various techniques. The Hindu and Christian populations have nearly stopped growing, as the crude death rate overtakes the crude birth rate and the ageing population is not being replaced fast enough. The Hindu and Christian fertility rates are around 1.5, well below the 2.1 fertility rates needed for a stable population. Only the Muslim fertility rate is above the replacement levels, in the 2011 census. The major issue with both the Hindu and Christian communities of Kerala is that they both have extremely low fertility rates. This will lead to both of them losing population share, while the Muslims gain population share. In 2011 census, the 0-4 population was 46.75% Hindu, while the Muslim population was 37.32% and the Christian population was 15.93%. This trend is set to accelerate. Table 4: The predicted populations of Hindus, Muslims and Christians in the Polynomial models in the coming decades. The population is given in 1000s and is rounded to the nearest 1000. From the above table, it should be clear that the Christian population will peak in 2021 and the Hindu population in 2031. From then, both will start decreasing, while only the Muslim population will be increasing. In the constant growth model, we have assumed that the average growth of the different communities over the last 2 decades will hold in future and predicted future populations based on this hypothesis. It is clear that in the constant growth model, the Hindus are going to be a minority in five of the nine districts, Kannur, Kozhikode, Malappuram, Ernakulam and Kanyakumari. They will constitute a majority only in four districts, namely, Palakkad, Thrissur, Alappuzha and Thiruvananthapuram. Muslims will be the majority in Malappuram. Christians will be the majority in Kanyakumari. Three districts, Kannur, Kozhikode and Ernakulam will have no one in the majority, but Hindus will constitute the plurality (largest share, but less than 50%). In the polynomial model, we fit a second degree polynomial to the population data points and predict the future populations based on this curve. In the polynomial model, it is clear that the Hindus and Christians will start declining not only in the percentages, but also in absolute numbers in almost all the districts. Hindus will be a majority in only four of the nine districts, namely, Palakkad, Thrissur, Alappuzha, and Thiruvananthapuram. In three of these four districts (Palakkad, Thrissur and Thiruvananthapuram), Hindus will be barely above the 50% mark. It is only in Alappuzha that Hindus will have a clear majority of greater than 60%. Muslims will be the majority in two districts, Kannur and Malappuram, and Christians will have a majority in Kanyakumari. Ernakulam and Kozhikode will have no one in the majority, but Kozhikode will also have a Muslim plurality. The decimation of Hindus in Malabar is clear in this model. Hindus will have declined from 65% in 1951, to ~40% in 2061. The logistic model assumes that all populations will stabilise in the long run and predicts future populations based on this assumption. The results suggest that as per this model the majority, minority pattern that existed in 2011 will hold in 2061 too, i.e., if Hindus were in majority in a district in 2011 they would continue to be so in 2061. The model assumes that the Hindu and Christian populations will become stable and not decline unlike what the fertility rates show. Thus, this model may be seen as the lower bound on the populations of the various communities. It is the most optimistic case for the Hindu and the Christian populations and the most pessimistic case for the Muslim population. We have modelled the populations of the entire state using the three different models separately. As may be seen, the Hindu population will be between 45% and 53%, the Muslim population will be between 30% and 41% and the Christian population will be between 12% and 17%. Every model shows the Hindu and Christian population shares declining and the Muslim population increasing. In the case of Kanyakumari, it is quite possible that the proportion of the Christians will hit a ceiling as the total number of possible converts hits a maximum. The bulk of the converts are the Dalits, the fisher folk and the Nadars – all of them are socially and economically backward. Together, the Dalits, Nadars, and the fishermen number about 12-13 lakh (65-70% of the total population) and it is this population that has been vulnerable to conversions. Many, if not most, of these have been converted. The upper castes and the economically strong, and socially forward Nairs, and Velallars, and the OBC Ezhavas and Vishwakarmas (other prominent castes of the region), who together number about 6-7 lakhs, are mostly invulnerable to conversions. 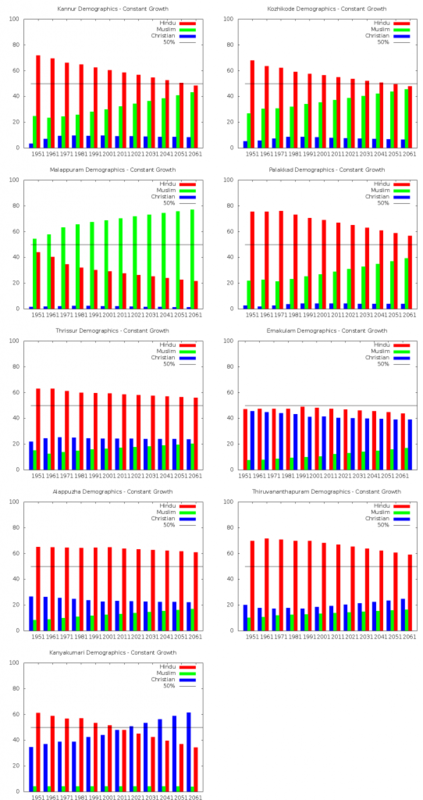 Assuming that about 80-90% of the vulnerable convert and that the fertility rates of the different castes are similar, the levels predicted by the various prediction techniques may be an overestimate in this case and the total number of conversions may peak around 55% as opposed to the 61% and 66% predicted by the constant growth and the polynomial models, respectively. In Kerala, the conversions peaked by 1950, and after that, there have been far fewer conversions. Further, the various socio-political organisations that have evolved in Kerala to espouse the interests of the economically and socially backward, have prevented further mass conversions to Christianity, as happened in Kanyakumari. In Kanyakumari, however, a combination of local politics and an economically and socially backward population, have contributed to the growth of a large Christian population. Further, it is important to remark here that Kanyakumari is the only district in this region, where conversions are still causing major demographic shifts. Between 1991 and 2001, Hindus lost nearly 4% of the population to Christianity and almost all of these were due to conversions. In conclusion, we can say that Kerala and South Tamil Nadu are set to become Hindu minority in the next 50 years. The various models vary on the extent to which the change will occur, but all concur that Hindus are set to become the minority. The lower fertility rate of the Hindus and Christians will see their percentage shares and absolute numbers decline. The authors are deeply grateful to Indian2019, for his detailed caste-wise breakup of the Kanyakumari district. All the statistics are taken from the respective census and . – AP Joshi, MD Srinivas and JK Bajaj, “Religious Demography of India”, Centre for Policy Studies, Chennai.